I was lucky enough to photograph Lorraine + John’s elopement with my friend Melissa of Lissa Ryan Photography. It was a super hot day in July and Melissa and I were worried about our bride and groom overheating, but John had just returned from a tour in Africa so he didn’t mind, even in full uniform. Lorraine caught a breeze by riding up to the first look on her famous pink vespa with a huge smile, veil and all! It was a memorable entrance that had passersby laughing and yelling their congratulations. From the moment they saw each other, it was clear we were in for a beautiful, romantic elopement. John had been gone for so long and all they wanted was to be together. 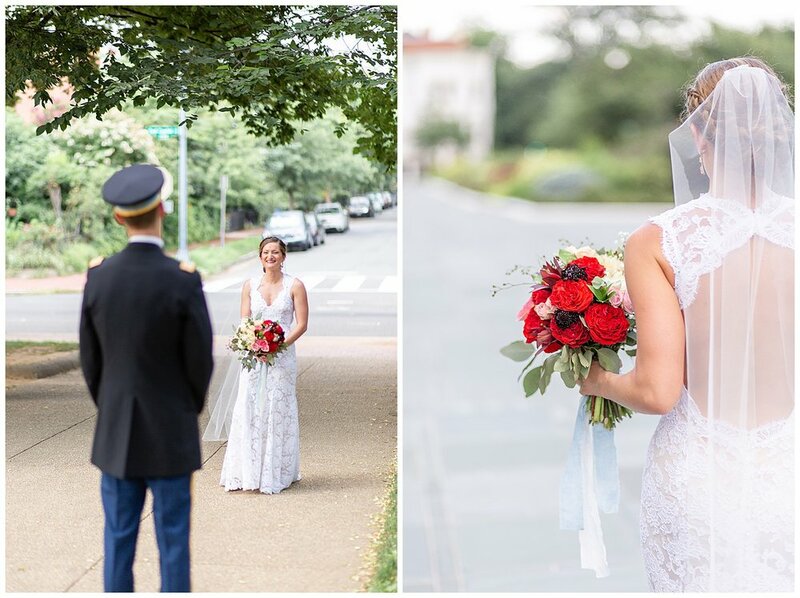 We visited a few iconic DC sites including the War Memorial on the National Mall where they self-officiated their marriage ceremony. After a pop of champagne and signing the marriage certificate, they rode off into the sunset to celebrate with family and friends at a local cafe. It was an intimate evening filled with love and one I will not soon forget.